Ensembl is pleased to announce a new release (version 48) due on 11 December. Featured in the release will be a new gene set for pika and the mouse lemur. These species will also be incorporated into homology calculations and alignments. Further upcoming features include variations from dbSNP128 for mouse and a new rat strain, RNB1 (from Japan). The human variation set will also feature updated data from Dr. Watson’s genome, along with updates from dbSNP128. Did you know about our new human and mouse databases (since release 41)? The functional genomics database (funcgen) is a first step into the world of annotating promoter and enhancer elements detected in the ENCODE project. See these features in ContigView (‘Regulatory features’ under the ‘Features’ roll-down menu) or access the data with our API. Finally, a new database integrating tissue expression data and presenting it on the rat genome will be available as EURATMart. Ensembl released version 47. News highlights: New gene sets for mouse, human and C. elegans. A new mouse assembly (m37) is available with a new Ensembl gene set, also a new human gene set has been determined for assembly NCBI 36. WormBase 180 has been imported into the browser for C. elegans. A word of warning: the FTP site has been rearranged, so please check the site for the updated format. Click here for more release news. New! An updated pig assembly and a new orangutan assembly in our Pre! site. Have you seen our animated tutorials? Learn how to use BioMart to convert IDs here. This new release hosts an updated zebrafish assembly (Zv7) along with newly determined gene sets for zebrafish, platypus and chimpanzee. SequenceAlignView is a new page allowing sequences to be compared across strains (mouse and rat)/individuals (humans). Variations can be displayed in this view. See the sitemap to find the page. More news is available on our website. Come find out what’s new! 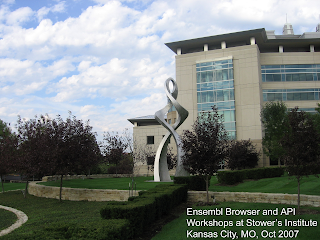 The latest update of the Ensembl Genome Brower and associated databases occurred 13 June, 2007 (release 45). This release was coordinated with the publication of the ENCODE project in the journal Nature. The first stage of this project focused on an in-depth view of 1% of the genome, contributing to a set of regulatory features that has now been incorporated into Ensembl, accessible in ContigView. via the new ‘Perl’ button. Those are the major updates at this time.